Home How To 4 Train Concessions you never knew about! 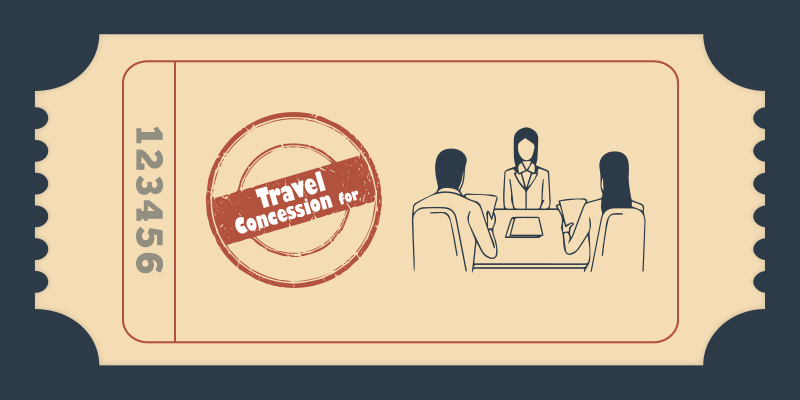 There are many aspects about train concessions which the Indian passengers are still not aware about. 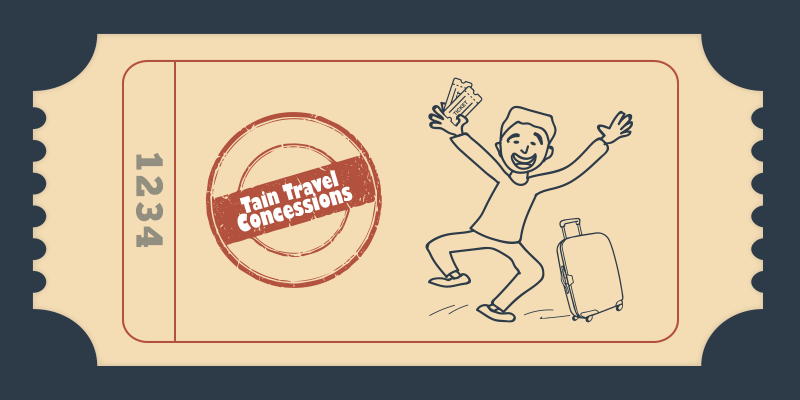 While we know about Indian railway handicapped concession, senior citizen concession and student concession, there are many other types of concession ticket or train discounts available to the passengers. In an earlier Blog, we had helped you understand the intricacies involved in Patient concessions. Today, we are going to 4 other types of largely unknown railway concessions. So, let us start. 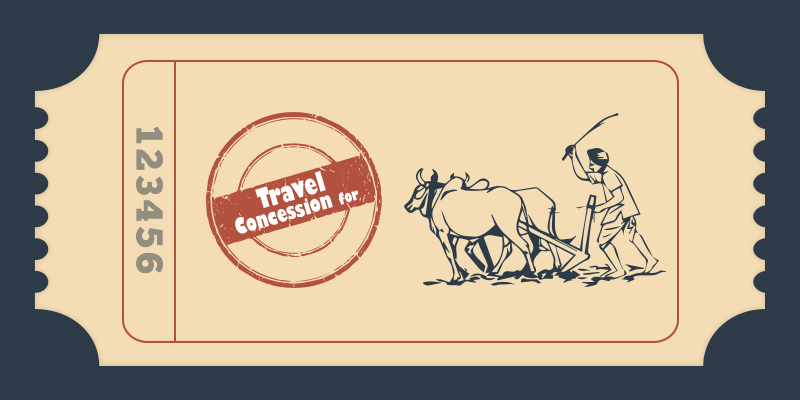 If you are a farmer traveling to attend any government organized agricultural exhibition, you could get a concession of 25% on the normal Indian railway fares. When you are traveling in a Special train run to accommodate the farmers attending a rally or exhibition, you could avail 33% concession in your second or Sleeper class tickets. As an extension of this concession category, the farmers along with the milk producers (dairy workers) could get a concession of 50% while traveling to attend a training program for better farming or dairy practices. Certificate issued on prescribed Indian railway concession form by Member of Parliament, Member of Legislative Assembly, District Magistrates, Sub Divisional Officer or Block Development Officers. Required documents supporting your travel intention must be furnished at the point of booking. Concession will be admissible only for travel parties in excess of 20 in the second class of mail or express trains. Concession tickets will be issued directly by Station Manager of the nearest station (boarding) after production and verification of documents. Farmers attending agricultural exhibitions can avail 25% concession in 2nd and SL class. Farmers and Milk Producers visiting National level Institutes for learning or training for better farming or dairy practices can get 50% concession in 2nd and SL class. Delegates attending Annual Conferences of Bharat Krishak Samaj and Sarvodaya Samaj (in Wardha) can apply for 50% concession in 2nd and SL class. Farmers traveling by Government sponsored Special trains to attend programs can get a 33% concession in 2nd and SL class. If you are an unemployed youth appearing in job interviews for Central or State government jobs (such as UPSC, SSC, etc. ), you could get a hefty discount of 50% on your second or Sleeper class Indian railway fares. The concession is also applicable for job interviews in other Public Sector Organizations such as Central or State Govt offices, Statutory Bodies, Municipal Corporation, Government undertaking bodies or Universities. Similarly, if you are traveling on scouting duties as a member of Bharat Scouts & Guides you could get a railway concession of 50% on second and Sleeper class ticket fares. Central or State government job interviews: Student’s concession certificate needs to be furnished at the time of booking. This certificate would be issued by the Head Master, Head Mistress or Principal of the educational institute where the student had undertaken the main written examination. The concession certificate along with a photo copy of admit card for Main written examination needs to be submitted to the Station Manager of your boarding station. Job interviews in other Public Sector Organizations: This concession is available for unemployed youths under the age of 35 years. During the concession process the candidate needs to provide attested copy of Call Letter from the organization mentioning the date & interview venue. Secondly, a copy of the application form submitted by the candidate to the organization mentioning that the traveling expenses are not being borne by the organization in question. All these documents must be attested by a Gazetted officer of Central or State Government. Scouting duties of Bharat Scouts and Guides: A certificate from the Scouter or Guider, which needs to be countersigned by the Secretary or Commissioner of the National or State Head quarters or the District Commissioner of State. Unemployed youths appearing in interviews for Central or State government jobs (such as UPSC, SSC, etc.) can get a concession of 50% in second and Sleeper classes. Unemployed youths (under 35 years of age) attending a job interview in other Public Sector Organizations (such as Central or State Govt offices, Statutory Bodies, Municipal Corporation, Government undertaking bodies, Universities, etc.) can apply for a concession of 50% in second and Sleeper classes. Youths traveling on scouting duties as a part of Bharat Scouts & Guides can avail a concession of 50% in second and Sleeper classes. Youths attending the National Integration Camps (such as National Youth Project or Manav Uththan Sewa Samiti) can seek a concession between 40-50% in second and Sleeper classes. If you are an artist and associated with entertainment performances, then you could avail a concession in the range of 50-75% on your travels. Registered professionals, companies or groups who deal with theatrical, musical, dance or magic performances fall under the periphery of this concession. Even students or artistes training at the National School of Drama in New Delhi can apply for this Indian railway concession. A certificate issued by the Central or State Sangeet Natak Acadamy or certificate from Department of Youth Affairs & Sports Ministry of Human Resource Development needs to be provided during the booking process. This needs to be supported by another certificate from Civil Authorities of the place of performance. The certificate should mention that the performance is exempted from payment of entertainment tax along with an undertaking by the organizers that the performance will have no commercial motive. Concession for students of National School of Drama will be provided after a certificate on Indian railway concession form is provided from the institution. Artists who are performing either solo or along with a group (such as dance, music, theater, magic, etc.) can get a concession of 75% in second class and Sleeper classes. The range of their concession would be 50% for 1st class, AC chair car, 3 AC and 2 AC. The concession is also applicable for Premium trains such as Rajdhani, Shatabdi and Jan Shatabdi. Film technicians who are traveling for work related to a film production can seek 75% concession in Sleeper class and 50% concession in 1st class, AC chair car, 3 AC and 2 AC. 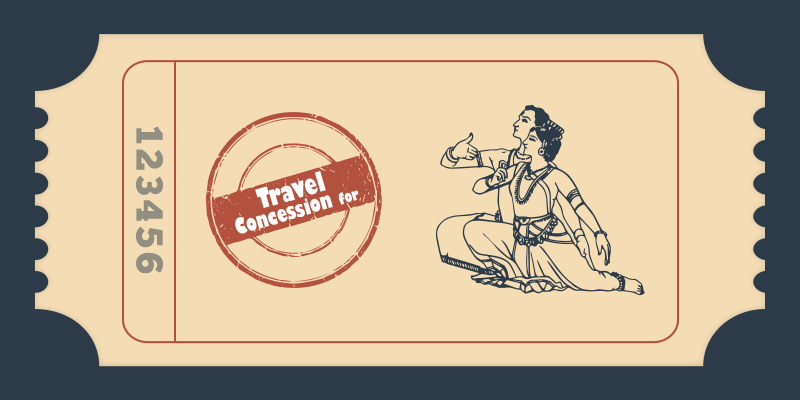 The concession is also applicable for Premium trains such as Rajdhani and Shatabdi. 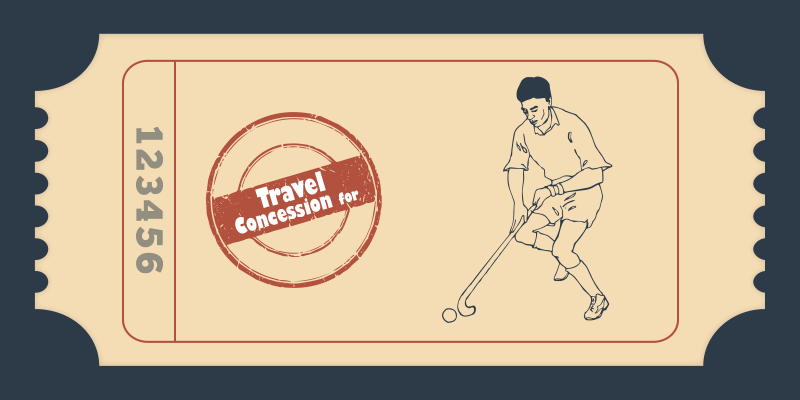 If you are traveling to participate in a State, National or International level tournament organized or recognized by the Education or University boards, State or All India sports associations (including the Olympic Association), then you could get a concession between 50-75% on your Indian railway fare. The range of concessions depends on the class or travel and the magnitude of the tournament. Similarly, persons traveling to undertake a mountaineering expedition organized by Indian Mountaineering Foundation can also seek a concession of 50-75%. The passenger needs to furnish a certificate from Hony. Secretary or Registrar of University, Deputy Secretary (sports) Association of Indian Universities, Hony. Secretaries of All India Sports Associations & their State units, Secretaries of Olympic Association/ State Olympic Committees (whichever may be applicable). Any sports person participating in All India or State level tournament can get Indian railway concession of 75% in second and Sleeper class. While a concession of 50% on Indian railway fare is available in 1st class. Sports person participating in a National level tournament will be applicable for a concession of 75% in second and Sleeper class. While a concession of 50% on travel fare is available in 1st class. Person undertaking a Mountaineering expedition organized by the Indian Mountaineering Foundation can seek a concession of 75% in second and Sleeper class or 50% of travel fare is available in 1st class. Now that you know, make good use of these unheard train travel concessions. How can the gender be changed in online booked tickets. As I went to nearest Reservation Counter to do the same, but they refused. As per old website of irctc it is mentioned that it can be done before 24 hrs of travel. I don’t think there is any online mechanism for the same. You can contact the station office at the boarding station. However, it is not a big deal unless you are the sole traveler.